Corbin Earns Their Bid In Medium Varsity! The Hounds are one step closer to defending their title after placing third today at the UCA Smoky Mountain Championship. The spirited routine earned Corbin their bid to compete in the Medium Varsity division at the National High School Cheerleading Championship in February. Watch their UCA Smoky Mountain performance! The reigning UCA Medium Varsity National Champions are headed south to Tennessee this Saturday to take the mat for the second time this season at the UCA Smoky Mountain Championship. This will be the Hounds' second time competing at the championship, and they hope to hit a solid routine that will give them the confidence they need before heading to nationals in February. The Hounds are improving every practice and hope to be adding more difficulty to their routine as the season progresses. Corbin’s biggest challenge that they've been working to overcome this season is the graduating of their largest group of seniors to date. “We not only lost seven of the most experienced athletes to come through this program, we also lost seven leaders who helped build and create the program from the ground up to where it is today,” explained O'Niell. The Hounds left Orlando as national champions and are working hard to have their program performing at that level when we return in February 2019. Corbin High School Cheerleaders after competing at the UCA Bluegrass Championship. Corbin High School is hoping to score high enough at the UCA Smoky Mountain Championship to earn their bid to compete in the Medium Varsity division at the NHSCC. The Hounds had a handful of athletes out at their first competition of the season, the UCA Bluegrass Championship, so they chose to qualify in the Small Varsity division instead for NHSCC. “Smoky Mountain was perfect timing for all to be back and healthy to give us the opportunity to qualify medium, where we normally compete,” O'Niell said. The Hounds are now in their sixth season competing in Orlando at the National High School Cheerleading Championship and the coaches are excited to continue their journey together with their athletes. 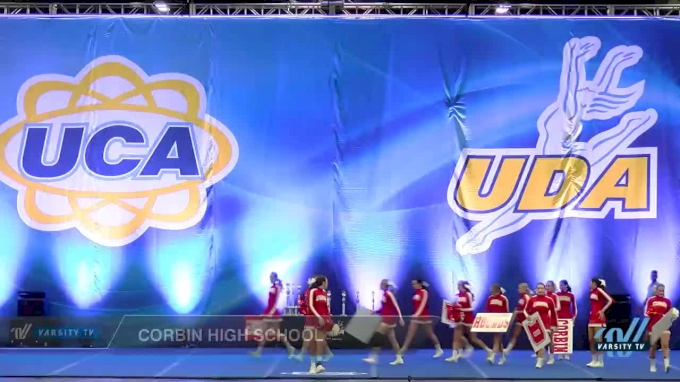 Cheer on the Corbin High School Cheerleaders as they take the mat and compete this weekend at the UCA Smoky Mountain Championship LIVE on Varsity TV!